I have not talked much about wearing glasses and getting the right eyewear even though it’s a hugely important part of your look. Glasses are right in the middle of your face so people cannot help but noticing them. So rather than spending lots of money on those really trendy shoes, you may want to invest in a good pair of glasses instead. You only get that one chance to make a great first impression! 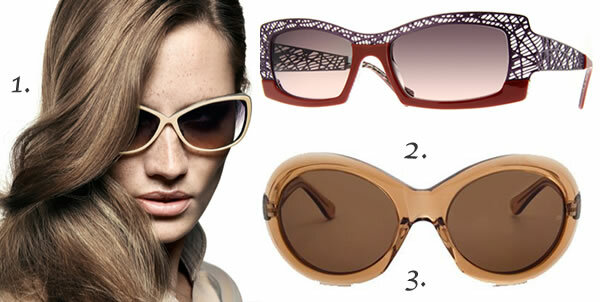 Eyewear can completely change your look – and depending on the frame, can make you look sexier, more youthful, etc. The wrong pair can certainly have the opposite effect. It’s fun to experiment with different types and become more edgier one day and more romantic the next. Eyewear is an accessory. Like for your shoes and hand bags you will want to match your glasses to the rest of your outfit, so it becomes one integrated whole. Although it’s good to have one very versatile pair that fits with everything, it’s great fun to have more pairs in different colors and styles. Since glasses come in so many different colors and styles, why not have multiple to match your moods? You may even want to have different frames for office, free time or formal parties. I’m very pleased that one of the best shops for high quality eyewear, Vizio Optic, has invited me to go through their shop and highlight some great eyewear options for women over 40. This shop specializes in specialty designer eyewear and brands that are usually not sold in more generic eyewear stores. Although they sell popular brands like Chanel and Ray Ban, most of their brands like Lafont, Face a Face, Oliver Goldsmith, etc. make ONLY eyewear. They only live and breathe eyewear designs and nothing else and focus on making things that are truly special. Another good example of such a brand is Swissflex, of which I will tell you more later. What eyewear should women over 40 go for? When it comes to glasses over 40 you will want to make sure that you pick glasses that do not age you. Try to add warmth and softness to your face. Translucent colors are often better than hard metals. Add color: one of the easiest ways to add a bit of hipness to your style. After 40 you will want things to go up not down, so choose frames that are horizontal and have a slight tilt at the outer edges. You will want to eye to be drawn upward! Get glasses that suit your face shape. Sunglasses are a 40+ woman’s best friend! If you are like me then your eyes show your age the most. In my case there are wrinkles and dark circles. The absolute best remedy for this are sunglasses which have the extra benefit of protecting your eyes from dangerous rays as well. You will hardly ever see me outside or in my car without them. Shops like VizioOptic will allow you to get your sunglasses with prescription glasses as well. Perfect for people like me who require glasses for driving. Sunglasses, frequently seen on the site. My black ones are at strength so perfect for driving! I basically wear my glasses almost the whole day. Although I would love to wear some of the frames I feature above, my eyes are quite peculiar and I get distracted by glasses that are too small or have very bright frames. Some glasses tend to get heavy on my ears as well. For all the reasons mentioned above most of my glasses are now from a brand called Swissflex which is also sold by VizioOptic. These glasses are super light-weight and almost unbreakable. I know I could look a lot sexier and hipper (and I would definitely get one of the colorful frames featured above if I stepped out with glasses in public) but these are super practical. I also wear my ‘driving glasses’ at tennis. These glasses automatically change color when in sunlight so they also function as sunglasses. They are the only sunglasses I can tolerate on the tennis court! For all the examples mentioned above and many, many more, head on over to VizioOptic. They truly have an amazing assortment of high quality glasses. Happy shopping! Over to you. I would love to hear about your experience with glasses. How important are they to your style? Do you have trouble finding the right eyewear? This is a sponsored article for VizioOptic. All opinions and glasses choices are my own! Very nice Tracey. Prescription sunglasses are such a good idea! My respons is short: I hate glasses on me. All of the expression in my face is around my eyes. When I wear glasses my whole appearance changes. I have glasses since I was 8 years old. At 17, with the first money I earned with a holiday job, I bought contact lenses. It made me so happy, in fact it changed my life. I do have have glasses. I bought them 19 years ago, after hours of contemplating and I still sort of like them. And my new reading glasses (normal frame) are not bad either. I know what you mean Greetje. I was ‘forced’ to wear glasses when I was young and hated them. The fact that they did not actually improve my eyesight did not help either. As I got older I tried contact lenses but no matter how hard I tried I could not tolerate them. So it’s glasses all the way for me now. I must say that I actually love a lot of the frames now and really like how they look on some women. It really has become a new accessory. I have worn glasses since I was 5 years old. Like Greetje I got contact lenses when I was 17 and they also changed my life as I became much more confident. I was tired of wearing thick heavy lenses in my glasses. Now it is much easier to get thinner, lighter lenses for your glasses. I have two pairs for distance and driving ( a pink pair and a purple pair), prescription sunglasses ( black and white frames) and reading glasses ( silver frames with black arms). I still wear contact lenses a lot but my eyes are changing as I get older so I have problems using them for the computer and close work. I have been incredibly lucky in that my eye sight was perfect until a couple of years ago when newsprint became blurry and I had to get reading glasses! I now have about five pairs of glasses, mostly from Poundland (LOL! ), in various colours. The only problem is, I can never find them. It drives me mad. Unless they are clamped on top of my head (not a good look) I either spend hours searching for them, or give up and end up squinting at the computer, at price tags, at instructions – everything. For me it’s the worst aspect of aging and I can see the wrinkles forming from the squinting! I have to say that scrambling around for your glasses is a sure sign you are of a certain age so lucky you! Otherwise I always pretend I am 10 years younger! I am sure you will get away with that. I have a solution for you. Buy vintage glasses, you know the ones with just one glass on a handle. Very elegant. Or take a small magnifying glass with you. Attach it with a string or chain to the inside of your bag. This way, you never lose it, and when you bring your bag (and the magnifying glass) close to the can of beans, nobody will spot it. Actually, I wrote this as a joke, but come to think of it… not such a bad idea. Ha ha! I have a magnifying glass but I look like Sherlock Holmes when I am peering at the can of beans! LOL! I really need to tie some glasses on me so that I never lose them – perhaps some elastic would do? As I get older a lot of my time seems to be spent looking for things! You have small magnifiying glasses as well. People would not even see that you are holding it in your hand just above the letters of the can. And I think it is better to tie that to your bag than to yourself. Glasses on a rope is also aging haha. The gardner (just once a year, before you get ideas that I am rich…) said his wife misplaces things too. The other day she looked for her car keys, nowhere to be found. At last she found them in the refrigerator. She had put them there, so not to forget to take milk and cheese with her to work when she left the house. I could so follow that line of thought. I might have done the same. And she is a lot younger than I am. We women are like squirrels. We stack and hide and then forget where we put it. You are so funny Greetje! And you know what? I am squinting at the moment because I have mislaid my glasses! LOL! Keys in the fridge is a good one! At least she did it on purpose! Perhaps my husband should do that as he often leaves his sandwiches (made the night before) in the fridge. As for squirrels – I have been watching our local squirrel go round my garden scratching his head because he has forgotten where he buried the hazel nuts! I love wearing glasses!! There are lots of really cool shapes, colors and designs out there to choose from. Here in Quebec, glasses are very costly. I bought my last pair at Costco. They are see through frames with a little yellow in them. Marc Jacobs line. Thanks for your feedback Andrea and thank you for your first comment at 40+Style! Good topic. I will have to buy frameless glasses (for driving at night) because one ear sits higher than the other and if I wear nice framed glasses they become lopsided immediately! I’m hoping to find ones with nice “arms” that have personality! Sylvia, this is so funny that you should mention this, because we decided to go glass shopping! Thank goodness I instinctively figured out your rules. We ended up with five pairs. I’ve been noticing the way some women, particularly silver women, accessorize with glasses. And I’m noticing my wife has only one set of pretty ugly everyday glasses, and one set of cool sunglasses. She is near-sighted and also needs glasses for reading, so she takes progressive lenses. So I told her, let’s go shopping! So the plan was to get one low key set for work with progressive lenses, then maybe to get a couple of other cool colored frames with regular prescriptions. Well, she got a little carried away. lol. Also since they gave us a discount for multiples, she ended getting four out of the five progressive. I said, what do you need progressives on all these frames? She says ‘I have trouble seeing the instruments when I drive’. I’m like who cares, you never go over 50mph anyway. lol. She won. So I decided to take some pix for y’all. The one black-looking frame didn’t photograph well. It’s not really black at all, it’s a sparkly gray. And yes the blue frame is pushing the limits, but I think she’ll look great driving our convertible! Hi Denton. Thanks for sharing these pictures with us. Your wife got some really funky glasses! Congratulations and enjoy! Next post: How important is perfume for your style?